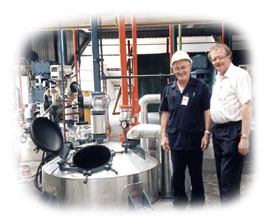 PATTERSON Industries Canada - a success story. PATTERSON Industries Canada designs, engineers and manufactures a wide range of process equipment and turnkey systems for the oil, gas and petro-chemicals; resins, coatings and adhesives; agricultural and general chemicals; plastics and rubber; steel; pulp and paper; mining and construction; pharmaceutical and food, and waste water treatment industries. Founded in the U.S., and Canadian owned since 1974, PATTERSON Industries Canada serves a global marketplace of process industries. Our expertise in individual component and system design utilizes mechanical, heat transfer, pneumatic, hydraulic, electrical, and computerized control functions all under one roof. While PATTERSON Industries (Canada) Limited was thriving selling process equipment worldwide, due to a rezoning to residential of the area of Scarborough that PATTERSON’s plant and offices have been located for over 60 years, PATTERSON Industries (Canada) Limited has closed operations at this location on December 31, 2012. PATTERSON has moved to a new location operating as a Division of ALL-WELD COMPANY LIMITED with plant and offices at 49 Passmore, Scarborough, ON, M1V 4T1. Our phone and fax numbers as well as our e-mail address and website remain the same. To ensure a seamless transition and to continue to manufacture and design PATTERSON process equipment of high quality and reliability, key personnel of PATTERSON Industries will continue to work at the new location. Like PATTERSON, ALL-WELD is a Canadian owned and operating company providing quality, time-proven equipment and engineering services to various industrial sectors since 1920. ALL-WELD has the skilled and experienced engineering, production and administrative personnel available to continue to manufacture all of the PATTERSON product lines. ALL-WELD also designs and manufactures in accordance with the ASME Code, Section VIII, Division 1 and carries the National Board of Boiler and Pressure Vessel Inspectors ‘U’, ‘S’ and ‘R’ Stamps of Approval in addition to the Certificate of Authorization from the Technical Standards and Safety Authority (TSSA) from the Province of Ontario. It also has ISO 9001: 2008 standing and is approved for designing and building of Pressure Vessels for the Peoples Republic of China. All aspects of PATTERSON's quality engineering, designing and manufacturing are customized to meet individual specifications and comply with internationally recognized codes and standards, including ASME, TEMA and CSA. PATTERSON's now over 75,000 sq. ft. facility, complete with state-of-the-art fabricating and machining equipment, high capacity cranes, enable us to manufacture and deliver large, complex components and systems. For more details on the equipment in our Plant, please see Sub-Contract Division. From portable mixers to giant field erected blenders, from simple vessels to complex process systems, our over 100 years of experience is employed in building the system to suit your needs and budget. Our fabrication experience covers standard and low temperature Carbon Steels, Stainless Steels, Monels, Nickels, Aluminum and Titanium, Inconels, Hastelloys. The plant is strategically located close to major airports, highways, railroads and North American shipping ports. 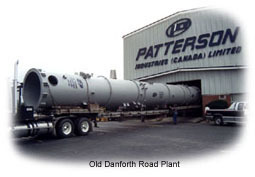 PATTERSON Industries Canada, located in Scarborough (Toronto), Ontario, was originally the subsidiary of a U.S. company with over 130 years experience. Traditional yet innovative, PATTERSON has forged a standard based upon proven design, engineering, performance, dependability and quality for process industry customers worldwide. PATTERSON's innovative team of industry professionals keep constant pace with technological developments and industry changes. We provide a single source for consultation, planning, coordinating, custom design, engineering and manufacturing of dependable process equipment, and systems that are competitively priced. Our strong industry leadership in product performance extends to after-sale service and provides smooth, hassle-free assistance, start-up, and commissioning you can depend on.